A recent National Resources Defense Council (NRDC) report calls for a ban on fracking in the Sunshine State by downplaying the importance of Florida’s longstanding oil and natural gas industry while peddling a combination of fearmongering and misinformation. To validate its point, NRDC makes it clear that the 700 direct oil and gas industry jobs it cites are “insignificant” and the indirect jobs – which the American Petroleum Institute has estimated to be in the hundreds of thousands – aren’t even worth counting. Equally insignificant, according to NRDC, is the $1.6 billion that the Florida mining industry, which includes oil and gas, contributed to the state’s GDP in 2017. If Florida’s decades-old oil and natural gas industry is so insignificant to the state and country, why then are groups like NRDC so focused on it? Florida’s oil and gas industry has had a small, but consistent share of U.S. oil production for decades. 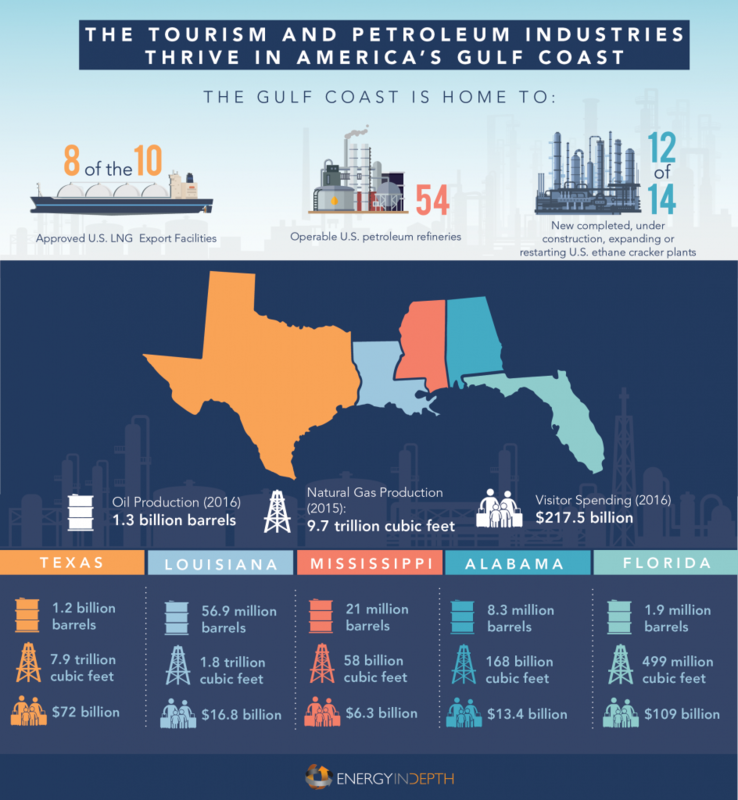 But where it differs from states like Texas and the rest of the Gulf Coast is that this production has occurred largely in the background. It does not take place across large portions of the state and these resources have been safely developed in a manner that has generally not drawn attention to the industry. And those safe, yet unseen operations are what attract groups like the NRDC to push for these types of fracking bans as part of the “Keep It In the Ground” (KIITG) agenda. A prime example of this occurred in Nevada. In Nevada – a state that had only seen about 20 fracking permits as of 2017 – the two organizations behind a Tom Steyer-backed initiative to ban fracking in the state have been prominent in the similar push to ban the practice in Florida: the Sierra Club and the Center for Biological Diversity (CBD). The strategy of anti-industry groups to target states with virtually zero or small, but consistent oil and natural gas production as places to ban fracking was also employed in Vermont and Maryland – not because fracking posed a threat to those regions, but because of the feasibility of passing such measures in areas where people are largely unfamiliar with the oil and natural gas industry. This strategy is especially evident in the NRDC report as the group discusses the practice of using acid to stimulate wells. Interestingly, NRDC acknowledges that fracking is not likely to occur in the Sunshine State but it misses the mark entirely in its explanation of matrix acidizing. As EID’s infographic on acid treatment explains, matrix and other acid treatments are commonly used practices in the Sunshine State. 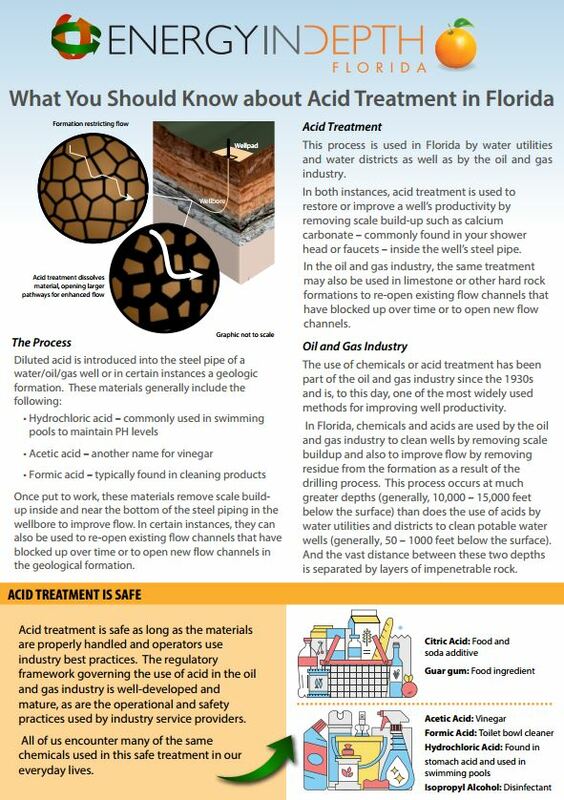 In fact, acid has been used to clean and stimulate Florida’s oil and gas wells since the 1930s. Importantly, water utilities and water districts in Florida have also been using the same technique for decades. Notably, NRDC never gives any examples of Florida’s water actually being impaired by the use of acid to stimulate or clean wells – despite a nearly 100 year history of the practice being used. And to be fair, it’s probably because – as is the case with fracking – incidents are incredibly uncommon, if they exist at all. What EID’s research found is that not only is the Gulf Coast tourism industry thriving alongside a booming oil and gas industry, but the same is occurring in states like California, Pennsylvania and North Dakota too. And when it comes to Florida, fracking has actually helped the state’s tourism industry in a big way – despite the technique not actually being used in the Sunshine State – by helping to lower the cost of fuel around the country, enabling more people to be able to travel. The NRDC tries to have it both ways. First by claiming incorrectly that Florida’s oil and gas industry is “insignificant” and second by treating it as so important that it is trying to ban a practice that is not presently used in the state. Florida’s energy industry is significant, and efforts by the NRDC, the Sierra Club and CBD to look for ways to downplay its importance – and worse, to try to ban production – are foolish. Florida’s nearly century old oil and gas industry is a boon for the people of the Sunshine State, and any attempts to stop local production would be bad for the state’s economy, bad for the direct and indirect workforce, and ironically, it could actually harm the water supply if acidizing is no longer allowed. That’s a lose-lose scenario for the Sunshine State.